Are you interested in ways to say thank you at work? One would hope so. In a workplace committed to creating an attitude of gratitude and employee recognition on a daily basis, every day should be Thanksgiving Day. Employee recognition doesn't have to be expensive and is appreciated by employees in almost any form. Company leaders also appreciate a thank you from employees when the organization takes time to recognize employees. Employee recognition is best approached creatively. While money is an important way to say thank you, once money is spent, it is easily forgotten. It is as if the recognition never happened. Ideas about ways to say thank you at work are limited only by your imagination. The power of saying thank you is magnified when the action, gift, or interaction is accompanied with a thank you note or card. Use the following ways to say thank you at work to employees and coworkers. Just say "thank you" — anytime, anyway, anyhow, and for any reason. Want to say more than thank you? It's important to know how to give great feedback to employees at work. It's very easy to say thank you in a way that makes employees feel valued and appreciated, so take the time to notice good contributions and successes. Daily feedback is best, weekly is admirable, but practice saying thank you nearly every day to some of your employees and coworkers. They and you will be happy that you took the time to care. Take the employee out to lunch. Keep drawings on the light side, especially if only one employee can win, but quick, fun drawings are ways to say thank you. Employee Benefits are also great opportunities to thank employees by providing perks and other generous, sometimes inexpensive benefits to employees. Make saying thank you to coworkers a common practice, not a scarce resource, in your organization. 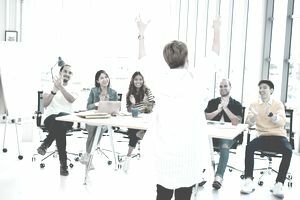 With these ideas and the 120 provided in the benefits and perks article, you have many ideas that will help you develop a work environment that fosters employee recognition and hence, employee and customer success. Motivated employees do a better job of serving customers well. Happy customers buy more products and are committed to using your services. When more customers buy more products and services, your company's profitability and success will skyrocket.